Why are there so many Welsh dialects? Does anyone know how this developed? First there is the broad distinction of North (Gogs) and South (Hwntws). Then in this course we are taught there are 5 dialects (I've seen other sources say 4-6). The country is not that large with a current population of 3 million. Yet, I imagine these dialects probably developed pre-1800 when Wales' population was around 500,000 or under. How did 5 distinct dialects develop in such a small population? The figure of 4-6 is variable because it depends on how you define a dialect. When you look at a dialect atlas of Wales, such as 'The Linguistic Geography of Wales' (long out of print), many sub-dialects are identified, too. The individual word distributions are very variable and have many large geographical overlaps. On top of the vocabulary variations, there are many variations in accent and several minor variations in grammar. Nowadays the dialect differences are reducing due to the impact of national written and spoken media and increased travel for education and work. Some mutations are less used, and in the spoken language a few new ones are apparently emerging. The origins of dialects lie in many patterns such as physical geography, industry and occupation, trading routes, surrounding languages, forms of government, social movement and mixing and so on. Wales, and Britain generally, has a long history of coastal, sea and land trading using routes dictated by a very varied physical geography in a relatively small area, so it has been subject to many linguistic influences over the recent couple of thousand yesrs, some of them very local. The English dialects and accents in Wales and the rest of Britain are also very variable. I am guessing it's because the country is quite mountenous with lots of valleys plus the original Welsh speakers were tribal, like the original Britains. Separation of peoples by geography or tribal differences can be responsible for a proliferation of dialects and even languages. Probably the same reason that there are so many dialects in English. :P In America, there's a huge difference from what is in England, and in each area of England and America, there are even more differences and dialects. It's just the distance between speakers and areas (which is how ideas spread when language was first evolving; outwards!) so the farther away an area is, the bigger of a difference in dialect there is. But, it still remains that every speaker of the language can pretty much understand any dialect as the variations aren't usually inhibiting. 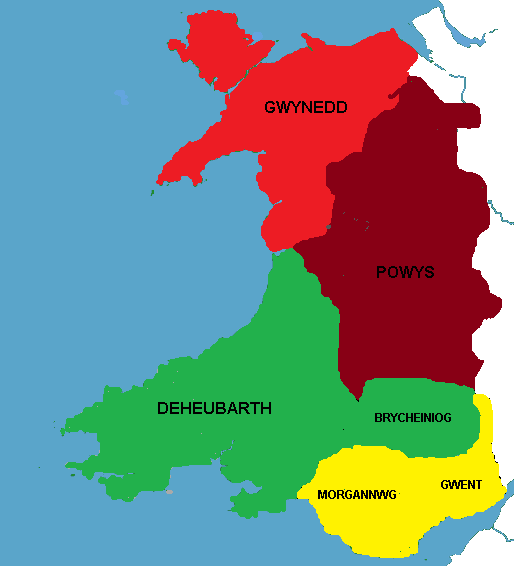 It is pretty interesting how the dialects map to the original kingdom of wales.